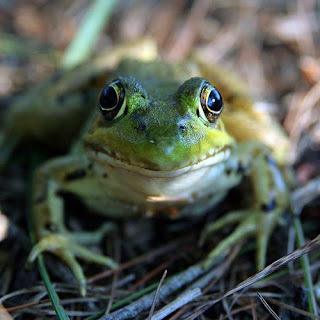 CTLE Blog: Come on baby, kiss that frog! Remember The Frog Prince ? This was the fairytale where the frog convinced the princess that if she kissed him he would turn into a handsome human prince and they would live happily ever after. What does this have to do with teaching? Well, around the end of each semester, many an undergraduate student makes allusions to this story. They seem to think that despite the fact that they've spent the entire semester sitting comfortably on a lily pad in a marsh somewhere (or whatever it is they've actually been doing besides studying), with a little bit of kissing up they can magically become students who will sail off into the sunset with a passing grade in your class. And you're meant to feel like the evil queen if you refuse to help them in their quest. Now I'm all about second chances. We've all run into tough spots from time to time that we needed a little help and understanding to get out of. After all, life happens, right? But this is why I keep in touch with my students throughout the semester, asking those who are doing poorly or suddenly show a drop in performance to meet with me to get extra help. This is also why I create extra credit assignments - so folks who dug themselves into a little hole can find their way back out. But if that hole is six feet deep, I'm sorry my dear, but you seem to have dug your own grave. I feel for these students, I really do (despite what you might have heard me mumble under my breath). The ugly truth however is that not everyone will succeed in college. Cutting some students extra breaks is not fair to the students who worked hard all semester (and trust me, they all have lives and difficulties of their own). It's not fair to future employers who take at face value the college degree you come to them with. It's not fair to you, the frog, as if you've never had to climb up out of the mud on your own then you'll never learn how. I don't think that these students are bad people. I don't even think they want special treatment - most of them come into my office not with a sense of entitlement, but embarrassed and desperate. My guess is that somehow along the way we (educators, parents) forgot that eventually Froggy would have to do things for himself. In the real world, not everyone gets a prize. If you consistently miss deadlines or fail to show up, you probably don't get to keep your job. A little bit doesn't always go a long way. And frogs don't turn into princes.